This here is a very late but heart-felt THANK YOU for helping us raise money and generate Raven’s Bags. The Bearded Wonder and I are just blown away at the response we’ve had and I know that because of you, some families will be very blessed. 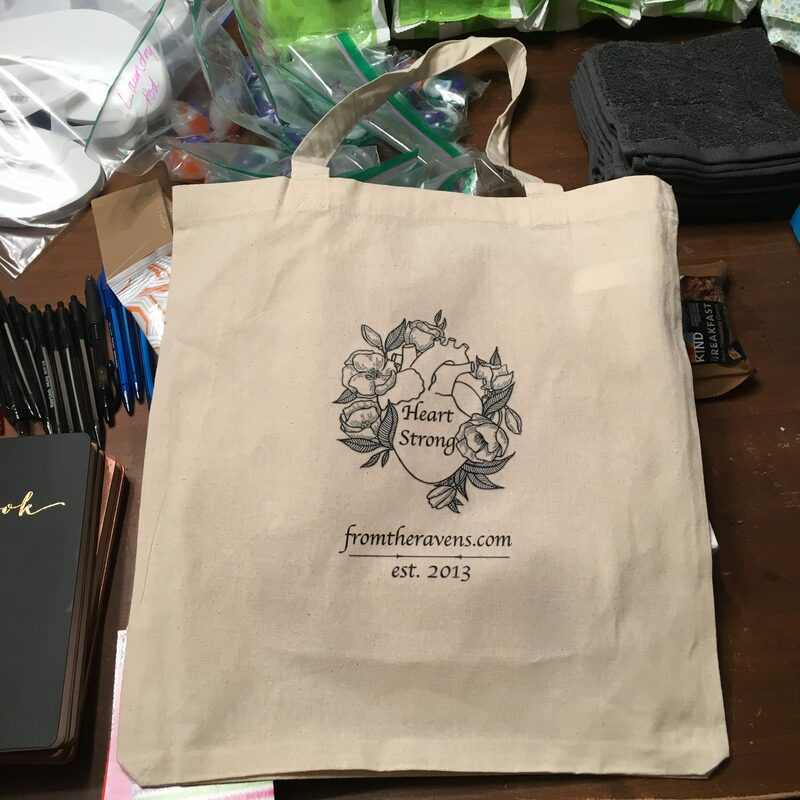 For those who are just tuning in, the Raven’s Bags are care packages meant to help busy families who find themselves hospital bound with a little one. Specifically, we are making these for the families at Boston Children’s whose little ones have the same disease as Jack, Pulmonary Vein Stenosis. 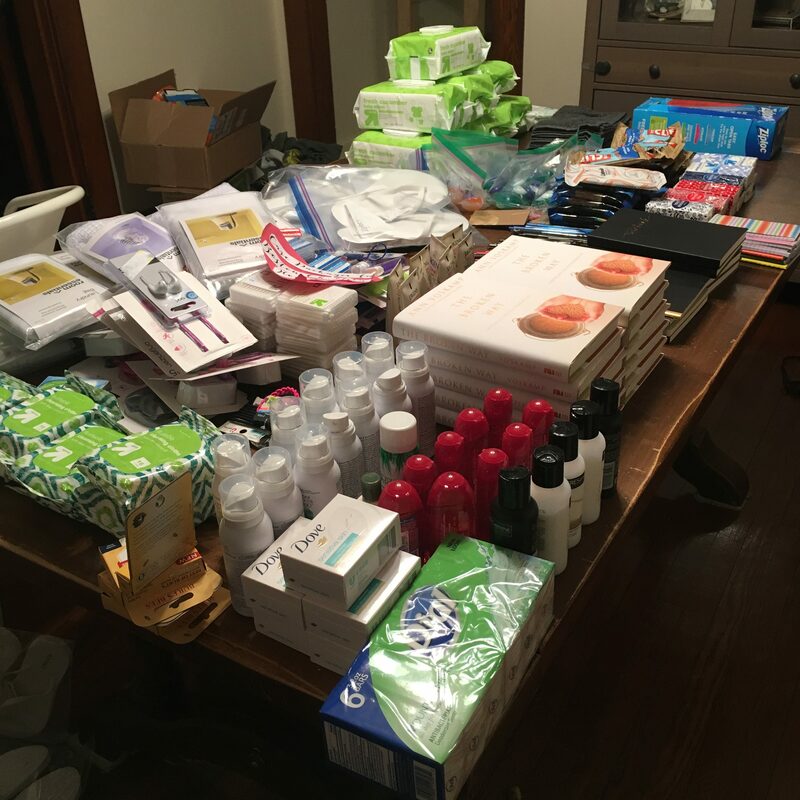 Altogether we raised $560 to generate these care packages, which is about $500 more than I expected. From headphones to flip flops for germy showers, we have been able to buy all the things we wished we had during our first hospitalizations. We are overwhelmed by your generosity. Also, a shout out to the lovely folks at VistaPrint were so kind as to give me a 50% discount on the bags that I designed. I am really pleased with how they turned out. Yay discounts! With the supplies, money and gift cards you donated we were able to purchase a whole mess of things to stuff these bags to the gills. And that’s just what we did. The kids helped. Jack too (sort of- in a very unhelpful way). That there is a whole heaping helping of toiletries and goodies. As a family, we packaged up these bags just in time for Jack’s appointment in Boston. We were able to deliver some of them to the nurse practitioner that heads up much of the Pulmonary Vein Stenosis program that Jack is a part of. She will hand out the bags to families in need. Also, since then, we were also able to hand deliver a Raven’s Bag and pray for a very beautiful young family in the hospital. That is always a healing experience for us. Giving back when we have been given so much through our many trials. So thank you all who were able to help us with our little project. We are so touched by the kindness of others. Thank you for helping us to pay it forward.